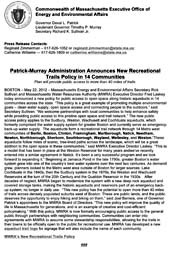 On Tuesday, May 22, 2012, Massachusetts Energy and Environmental Affairs Secretary Rick Sullivan, MAPC Deputy Director Joel Barrera and Massachusetts Water Resources Authority Executive Director Fred Laskey announced a new policy to make trails more accessible to the public along several MWRA aqueducts that are no longer in active service. This page provides information on the new policy. Updates will be posted here. The new policy will provide MWRA with more control over public access activities on MWRA controlled land, while creating an opportunity for MWRA to partner with local municipalities for their enjoyment of these natural resources. The announcement is the first step in a process. MWRA staff have begun to work with individual communities to develop agreements that detail the specifics on exact location of the trails, permitted uses, maintenance responsibilities and other factors. These agreements will preserve the Authority's primary water supply interest, while allowing host communities to officially partner with MWRA to become better stewards of MWRA land within their respective communities. 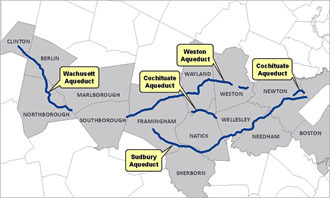 The Metropolitan Area Planning Council (MAPC), the regional planning agency for metropolitan Boston, has dedicated funding from a federal Community Transformation Grant toward assisting municipalities to evaluate and plan for the opportunity to open aqueducts as public trails. MAPC will provide technical assistance on the permit application and assist municipalities as they begin the planning process for this new open space option. For more information, please contact David Loutzenheiser, MAPC, at dloutzenheiser@mapc.org or617-451-2770 x 2061.